Host your next party in style with this elegant mirrored top cake stand with crystals. You can display cake, cupcakes, cake pops, or any other treat for your guests. 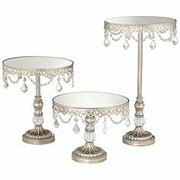 These lovely stands are 10", 12", and 15" high and top is 10" wide.